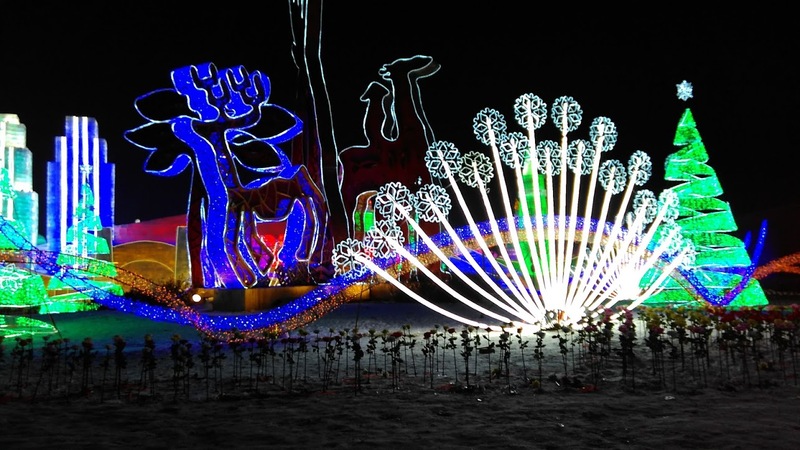 We’ve been to Harbin for Christmas, the provincial capital of Heilongjiang. We have decided to go there with the suggestions of some friends, who told us that it is magical. 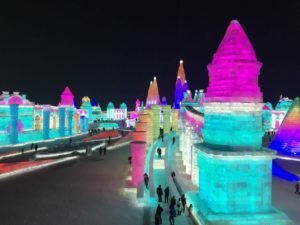 We got to Harbin on December the 22nd, just on time to visit the Ice festival and the exposition before the actual beginning of the festival, which is usually in Chunjie (春节)，Chinese New Year. 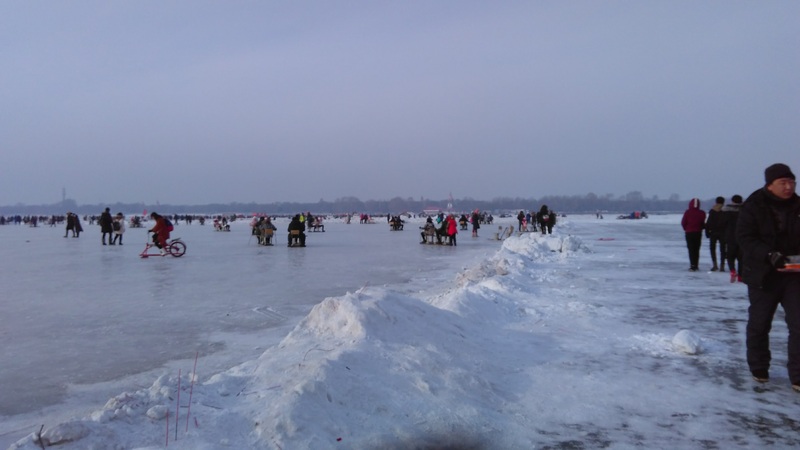 On the one hand, this has been a reasonable choice for us, because we could visit the points of interests avoiding the crowd typical of the holidays in China, especially during the Spring Festival, the most important festival. On the other hand though, not all the expositions were ready for the visitors, although there was no ticket discount for us. 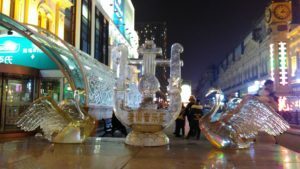 Still, it’s been a way to get a bit of a “Christmas atmosphere” in China (in the city where we live, Jinan, people do not care much about Christmas). When people suggested having a look at the river a wasn’t interested at all: why should a frozen river be interesting for me at all? Being from the South of Italy, I have never thought that spending hours sliding on the frozen surface of the river could be so much fun! There are many people renting snow-toboggans of all kinds for a low price, and you can use them as long as you want. Needless to say, if you plan to enjoy the experience mind to wear enough clothes, especially for the shoes, snow boots are a good idea. Otherwise you would stop feeling your toes within one hour. I didn’t know that river is the same where the ice blocks used to build the Ice Festival’s buildings come from! 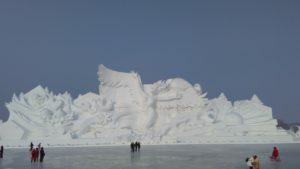 If you’re interested in of the ice blocs are craved, check out this video! Very expensive actually, but personally I thought it was worth to be visited. When we went there, the ticket was about 300 yuan, way more than any other museum or touristic point in China. But anyway, it was a unique exposition, and it is a reasonable price in comparison with what we usually pay in Europe. The exposition is composed of several snow sculptures, with a brief explanation of the opera in Chinese and English. The landscape is breath-taking, it’s white with snow everywhere you look. Also, some of the sculptures are very well done and interesting in the meaning they’re trying to represent. Again, you’ll find a little ice-slide in the ice sculptures exposition too, where you can have entered for free (it’s included in the exposition’s ticket) and have fun for as long as you want. Near the slide, there is also a little souvenirs shop (or at least I guess that’s a souvenirs shop) inside of a snow building. There are also some cafes, but where you could get some cheap meal, but do not expect too much: watery coffee or instant noodles. It would warm you up at least. Yes, it’s true, it is magical. “Even better than in Europe!” I heard two Chinese people claiming. To be fair, I agree: I don’t think we’d ever find anything similar in Europe. 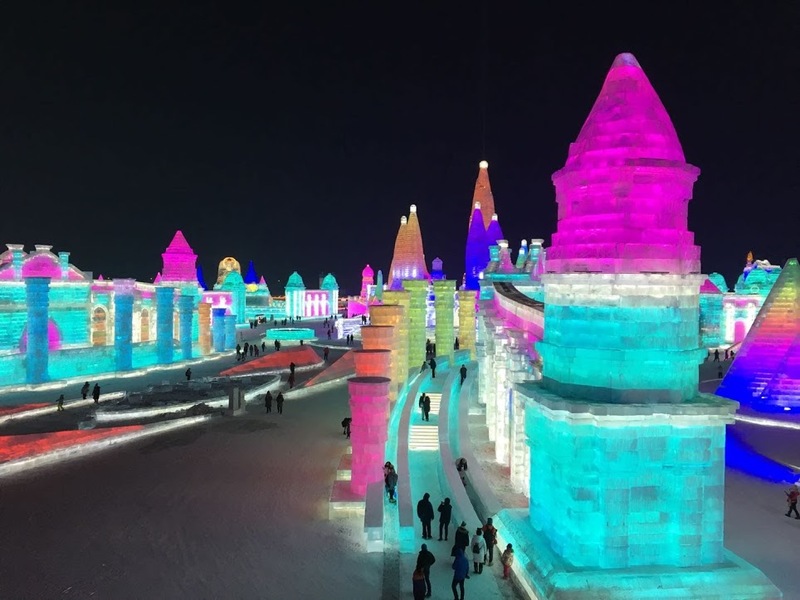 But this is also because you need a little bit of a kitsch taste to make up so many ice sculptures in rainbow colors: only Chinese people could think of turning the Temple of Haven into a giant Ice Blue/Green/Red Pagoda. No complaints anyway, the result is stunning. Thumbs up. 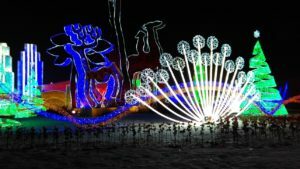 There are a couple of bad remarks I want to do though, about the exploitation of animal: from the reindeers to the sled dogs, from the seals and penguins exposed in tiny cages to the foxes that you can hold and take a picture with them for 50 yuan. These things I would have been happy not to see. Tips: If you plan to go the festival be aware that you might need to queue to get in, so mind to go a bit in advance. When we went there, the ticket was 300 yuan, but if you’re a student under 25 years old, you can get a discount. Inside the festival’s area, there is no real restaurant, but there are a few places where you can get a snack or a hot drink. However, there is a Mc Donald right in front of the entrance, if you like this option. I didn’t know why that street is named “The European Street,” and I didn’t get the answer after going there. Personally, I don’t think there is any specific “European” feature about this street; it is just a pretty boulevard where to have a walk, with a bunch of shops (many of which sells Russian souvenirs, due to the Russian influence on the culture of the city). What made the street very pretty where the ice sculptures at every corner: they were smaller than in the Ice Festival of course but still pretty for the tourists to take pictures. It is funny how many of the sculptures are advertising the sponsor who’s paying for them. The Catholic Church is just at the end of the European Street. The pretty architecture shows the influence of Russian culture in the town. 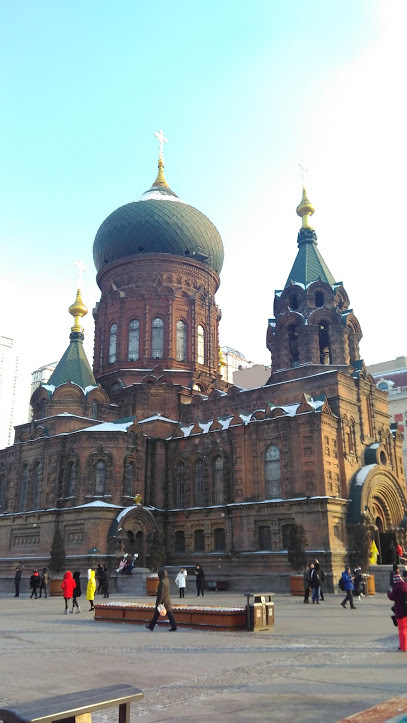 In fact, the Church is not a holy church anymore; it has now been turned into a museum of Harbin’s history, with tons of pictures of daily life’s sceneries from the 20th century onwards. The entrance ticket price is 5 yuan with students’ discount. It is interesting, but unfortunately, the explanation panels in English are not many, so it is easier to understand for Chinese speakers. Also, the inside of the Church lacks restauration; it looks like everything is about to fall apart. 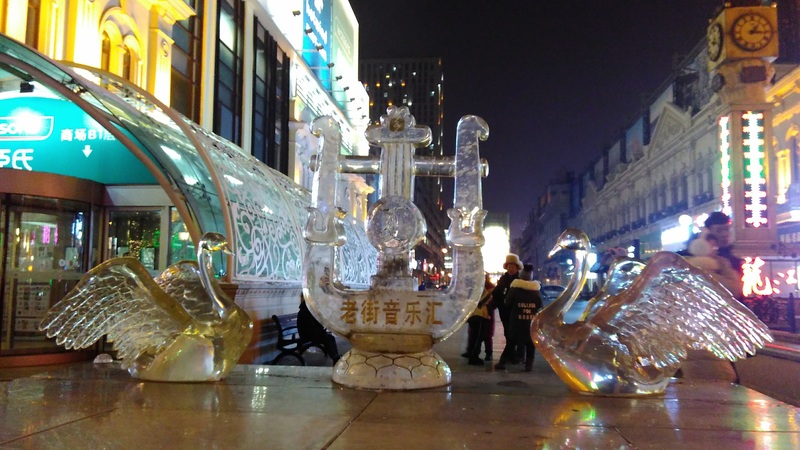 So, this is an overview of my impression of Harbin. All in all i highly recommend visiting it, not only for the Ice Festival which is a great exposition, but also because the unique allure of this city. One last tip: mind to wear enonught layers of clothing, or you won’t enjoy your stay!